I've never had an enormous perfume collection because many seemed too heavy for daily wear. When I read about Calvin Klein's Endless Euphoria, it sounded like what I've been looking for. This is a daytime version of Calvin Klein's original Euphoria perfume. It's described as a light, airy scent and that made me think of spring. I love having lighter options in my fragrance collection! Style | Everyone's talking about pastels this spring and this packaging is definitely in-keeping with that trend. I love the peach and pink tones while the bottle has a sleek, modern feel. I typically go for more simple styles with decor so this bottle fits right in. It has a fresh, feminine look without looking tacky or over-done like a lot of other perfume bottles. My one critique is that it is a bit awkward to hold as it's a wide, short bottle. That doesn't stop me from enjoying the scent though! Scent | When I think of daytime scents, I think of lighter, fresh notes. This perfume has notes such as cherry blossom, violet, mandarin, sandalwood and bare musk accord. It has a great balance of floral and fresh without being too sweet. (And if you've read any of my fragrance posts, you know I live for sweet scents!) 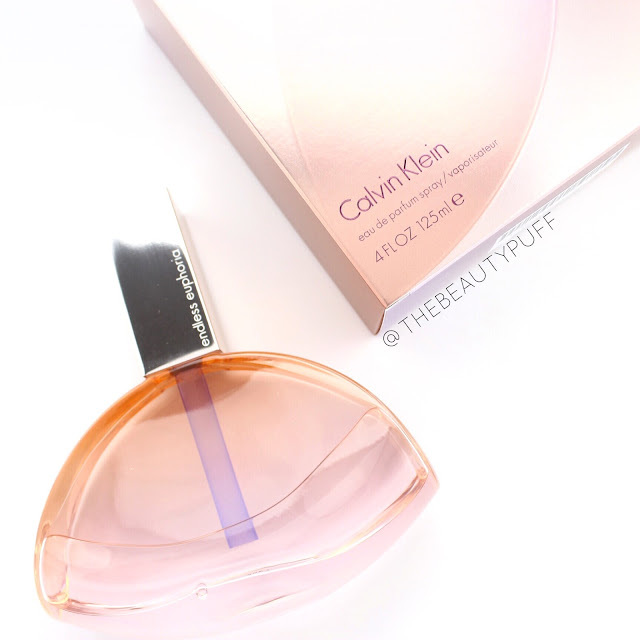 Calvin Klein's Endless Euphoria has a more sophisticated scent profile than your typical fruity or floral body mists. It appeals to those who want those same notes, without being too juvenile. Plus, one of my favorite spring scents is cherry blossom so I love finding it in longer lasting perfumes as opposed to my lotions that don't linger very long as I'd like. It's a fantastic scent for spring and summer. If you want a light, fresh scent for the warmer months that lasts, I definitely recommend checking out Calvin Klein's Endless Euphoria. I can't believe it's taken me so long to try this amazing fragrance! You can find this scent, along with more from Calvin Klein below.